Weinmann, M.; Blomley, R.; Weinmann, M.; Jutzi, B. (2018). Investigations on the potential of binary and multi-class classification for object extraction from airborne laser scanning point clouds. 38. Wissenschaftlich-Technische Jahrestagung der DGPF und PFGK18 Tagung, München, 7-9. März 2018. Hrsg. : T.P. Kersten, 408–421, DGPF, München. Stilla, U.; Jutzi, B. (2018). Full-waveform analysis for pulsed laser systems. Topographic Laser Ranging and Scanning. Ed. : J. Shan, CRC Press, Boca Raton. Niessner, R.; Schilling, H.; Hinz, S.; Jutzi, B. (2018). Klassifikation von Fahrzeugen aus RGB- und LiDAR-Daten mit Convolutional Neural Networks. 38. Wissenschaftlich-Technische Jahrestagung der DGPF und PFGK18 Tagung, München, 7-9. März 2018. Hrsg. : T.P. Kersten, 767–777, DGPF, München. Chen, K.; Fu, K.; Sun, X.; Weinmann, M.; Hinz, S.; Jutzi, B.; Weinmann, M. (2018). DEEP SEMANTIC SEGMENTATION OF AERIAL IMAGERY BASED ON MULTI-MODAL DATA. International Geoscience and Remote Sensing Symposium, Observing, Understanding and Forecasting the Dynamics of Our Planet (IGARSS 2018), Valencia, E, July 22-17, 2018, IEEE, Piscataway, NJ. Jutzi, B. (2017). Less Photons for more LiDAR? A Review from Multi-Photon-Detection to Single-Photon-Detection. 56th Photogrammetric Week (PhoWo 2017), Stuttgart, 11.-15. September 2017, 6 S.
Jutzi, B.; Toth, C. (2013). 16th Brazilian Remote Sensing Symposium. Event Report. Foz do Iguacu, Brazil, April 13-18, 2013. ISPRS e-Bulletin, (3), online. Jutzi, B.; Toth, C. (2013). 16th Brazilian Remote Sensing Symposium, Foz do Iguacu, Brazil, April 13-18, 2013. Photogrammetrie, Fernerkundung, Geoinformation, 2013 (5), 538–538. Jutzi, B. (2012). Extending the range measurement capabilities of modulated range imaging devices by time-frequency-multiplexing. Allgemeine Vermessungs-Nachrichten, 2, 54–62. Jutzi, B.; Rottensteiner, F. (2012). PIA11 - Photogrammetric Image Analysis. ISPRS e-Bulletin, (2). Jutzi, B. (2012). Bericht: ISPRS Joint Workshop "PIA11 - Photogrammetric Image Analysis". Photogrammetrie, Fernerkundung, Geoinformation, (1), 71–73. Jutzi, B. (2012). Erweiterung des Entfernungsmessbereichs bei modulierten Entfernungskameras durch ein Zeit-Frequenz-Multiplexverfahren. Allgemeine Vermessungs-Nachrichten, 2012 (2), 54–62. Silva Centeno, J. A.; Jutzi, B.; Alves de Oliveira, A. A. (2012). Noise reduction for Range imaging devices. Highly Precise Positioning and Height Determination using GPS. Ed. : M. Mayer, 53–57, KIT Scientific Publishing, Karlsruhe. Braun, A. C.; Weidner, U.; Jutzi, B.; Hinz, S. (2011). Integrating model knowledge into SVM classification - Fusing hyperspectral and laserscanning data by kernel composition. 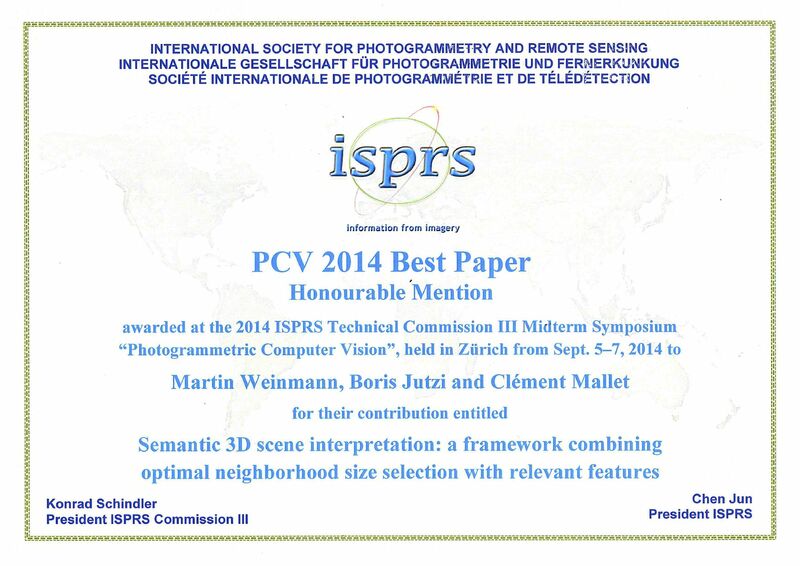 International Society for Photogrammetry and Remote Sensing. Jutzi, B. (2011). Grundlagen der elektrooptischen Lasermesstechnik. Optronische Informationssysteme. Handbuch der Egonomie. Ed. : H. Schmidtke, CD-ROM, Bundesamt für Wehrtechnik, Koblenz. Jutzi, B. (2011). Potenziale des Full-Waveform-Laserscanning zur Erfassung von Flussvorlandrauheiten. Zeitgemäße Erfassung und Bereitstellung von Geobasisdaten für die WSV : Kolloquium am 6./7. April 2011 in Koblenz, 118–124, Bundesanst. für Gewässerkunde, Koblenz. Braun, A. C.; Weidner, U.; Jutzi, B.; Hinz, S. (2011). Integrating external knowledge into SVM classification - Fusing hyperspectral and laserscanning data by kernel composition. The international archives of photogrammetry, remote sensing and spatial information sciences, 38, Part 4/W19, CD. Stilla, U.; Rottensteiner, F.; Mayer, H.; Jutzi, B.; Butenuth, M. (2011). Photogrammetric Image Analysis PIA11. The international archives of photogrammetry, remote sensing and spatial information sciences, 36, Part 3/W22, CD. Jutzi, B. (2010). Architectural applications - a challenge for active sensing. Documentação do Patrimônio Arquitetônico. Ed. : A.L. Amorim, Vol. 8, No 2. Jutzi, B.; Thiele, A.; Meyer, F.; Hinz, S. (2010). Relations between SAR tomography and full-waveform LIDAR for structural analysis of forested areas. 2010 IEEE International Geoscience and Remote Sensing Symposium (IGARSS 2010), Honolulu, Hawaii, USA, 25 - 30 July 2010, 3267–3270, IEEE, Piscataway (NJ). De Oliveira, A.; Centeno, J.; Jutzi, B. (2010). Tratamento de ruído em imagens de distância obtidas com a câmara PMD[VISION]®CAMCUBE 2.0. SIMGEO - III Simpósio Brasileiro de Ciências Geodésicas e Tecnologias da Geoinformação, Recife-PE, 27-30 de Julho de 2010, 001–007, UFPE, Recife (PE). Jutzi, B. (2009). ISPRS Hannover Workshop 2009 "High-Resolution Earth Imaging for Geospatial Information" vom 2.–5. Juni 2009. Photogrammetrie, Fernerkundung, Geoinformation, 2009 (6), 561–565. Stilla, U.; Jutzi, B.; Reitberger, J.; Yao, W.; Krzystek, P. (2009). Full Waveform Laserscanning - Auswertemethoden und Anwendungen. Terrestrisches Laserscanning (TLS 2009) - Yes, we Scan! Beiträge zum 91. DVW-Seminar, Fulda, 19. und 20. November 2009, 49–67, Wißner, Augsburg. Jutzi, B.; Gross, H. (2009). Normalization of lidar intensity data based on range and surface incidence angle. International Archives of Photogrammetry and Remote Sensing, 38 (3/W8), 213–218. Jutzi, B.; Gross, H. (2009). Nearest Neighbor classification on Laser point clouds to gain object structures from buildings. High-resolution earth imaging for geospatial information. International Archives of Photogrammetry and Remote Sensing, 38 (1-4-7 / W5). Jutzi, B. (2009). Investigations on ambiguity unwrapping of range images. International Archives of Photogrammetry and Remote Sensing, 38 (3/W8), 265–270. Jutzi, B. (2009). Bericht: ISPRS Joint Workshop "High-Resolution Earth Imaging for Geospatial Information". Photogrammetrie - Fernerkundung - Geoinformation, 2009 (6), 558–562. Gross, H.; Jutzi, B.; Thoennessen, U. (2009). Classification of Elevation Data based on analytical versus trained Feature Values to determine Object Boundaries. Zukunft mit Tradition. Vorträge, 29. Wissenschaftlich-Technische Jahrestagung der DGPF, Jena, 24. - 26. März 2009. Hrsg. : E. Seyfert, 315–326, DGPF, Berlin. Butenuth, M.; Jutzi, B. (2009). Report: ISPRS Joint Workshop "High-Resolution Earth Imaging for Geospatial Information". ISPRS e-Highlights, 12 (9), 5. Stilla, U.; Jutzi, B. (2008). Waveform analysis for small-footprint pulsed laser systems. Topographic Laser Ranging and Scanning: Principles and Processing. Ed. : J. Shan, 215–234, Cell Press, Boca Raton, FL. Rottensteiner, F.; Jutzi, B. (2008). ISPRS Workshop: Photogrammetric Image Analysis (PIA07). VGI, 2008 (1), 46. Jutzi, B. (2008). ISPRS Joint Workshop „PIA07 - Photogrammetric Image Analysis. Photogrammetrie, Fernerkundung, Geoinformation, 2008 (1), 42–45. Gross, H.; Jutzi, B.; Thoennessen, U. (2008). Intensity Normalization by Incidence Angle and Range of Full-Waveform LIDAR Data. The international archives of photogrammetry, remote sensing and spatial information sciences, 37 (B4), 405–412. Bretar, F.; Chauve, A.; Mallet, C.; Jutzi, B. (2008). Managing full waveform LiDAR data: A challenging task for the forthcoming years. The international archives of photogrammetry, remote sensing and spatial information sciences, 37 (B1), 415–420. Jutzi, B. (2007). Analyse der zeitlichen Signalform von rückgestreuten Laserpulsen. PhD dissertation. Stilla, U.; Yao, W.; Jutzi, B. (2007). Detection of weak laser pulses by full waveform stacking. The international archives of photogrammetry, remote sensing and spatial information sciences, 36 (3/W49A), 25–30. Gross, H.; Jutzi, B.; Thoennessen, U. (2007). Segmentation of tree regions using data of a full-waveform laser. The international archives of photogrammetry, remote sensing and spatial information sciences, 36 (3/W49A), 57–62. Jutzi, B. (2006). ISPRS Workshop 3D Mapping from InSAR and LiDAR. Photogrammetrie, Fernerkundung, Geoinformation, 2006 (1), 63. Jutzi, B.; Stilla, U. (2006). Precise range estimation on known surfaces by analysis of full-waveform laser. The international archives of photogrammetry, remote sensing and spatial information sciences, 36 (3), 234–239. Jutzi, B.; Stilla, U. (2006). Characteristics of the measurement unit of a full-waveform laser system. The international archives of photogrammetry, remote sensing and spatial information sciences, 36 (1A), CD-ROM. Jutzi, B.; Stilla, U. (2006). Characteristics of the measurement unit of a full-waveform laser system. Revue française de photogrammétrie et de télédétection, 182 (2), 17–22. Jutzi, B.; Stilla, U. (2005). Waveform analysis of laser pulses for gaining range accuracy. ISPRS WGI/2 Workshop on 3D Mapping from InSAR and LiDAR, CD-ROM. Jutzi, B.; Stilla, U. (2005). Measuring and processing the waveform of laser pulses. Otical 3-D measurement techniques VII. Vol 1. Ed. : A. Gruen, 194–203. Jutzi, B.; Stilla, U. (2005). Erfassung und Analyse der zeitlichen Signalform bei gepulsten Lasersystemen. Photogrammetrie, Laserscanning, optische 3D-Messtechnik: Beiträge der Oldenburger 3D-Tage 2005. Hrsg. : T. Luhmann, 203–2013, Wichmann, Heidelberg. Jutzi, B.; Neulist, J.; Stilla, U. (2005). High-Resolution waveform acquisition and analysis for pulsed laser. The international archives of photogrammetry, remote sensing and spatial information sciences, 36 (1W3), CD-ROM. Jutzi, B.; Stilla, U. (2005). Waveform processing of laser pulses for reconstruction of surfaces in urban areas. The international archives of photogrammetry, remote sensing and spatial information sciences, 36 (8W27), CD-ROM. Jutzi, B.; Neulist, J.; Stilla, U. (2005). Sub-pixel edge localization based on laser waveform analysis. The international archives of photogrammetry, remote sensing and spatial information sciences, 36 (3W19), 109–114. Jutzi, B.; Stilla, U. (2004). Extraction of features from objects in urban areas using space-time analysis of recorded laser pulses. The international archives of photogrammetry, remote sensing and spatial information sciences, 35 (B2), 107–112. Jutzi, B.; Stilla, U. (2003). Laser pulse analysis for reconstruction and classification of urban objects. The international archives of photogrammetry, remote sensing and spatial information sciences, 34 (3W8), 151–156. Jutzi, B.; Stilla, U. (2003). Analysis of laser pulses for gaining surface features of urban objects. 2nd GRSS/ISPRS Joint Workshop on Remote Sensing and Data Fusion over Urban Areas. URBAN 2003, Berlin, May 22-23, 2003, 13–17, IEEE, Piscataway, NJ.